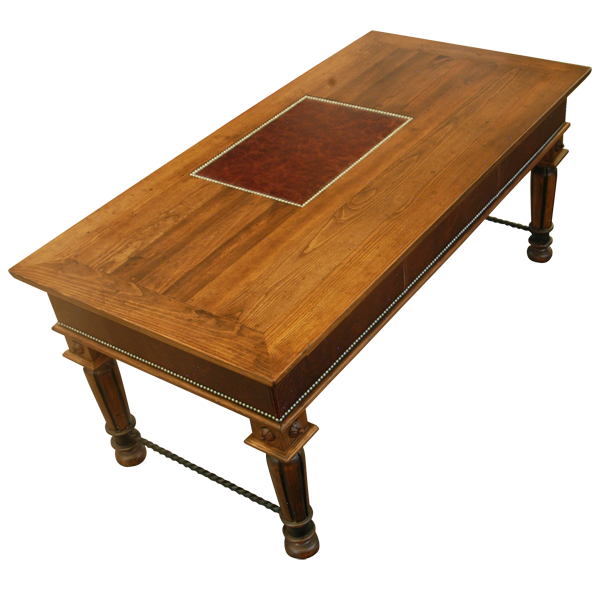 This handcrafted, Western style desk has a luminous, light finish that enhances the beautiful, natural grain of the desk. A small portion of the top of this desk, located directly above the large, rectangular drawer, is covered with rich, brown, full grain leather. Also, all of the sides under the top rim are covered with matching, brown, full grain leather. The desk has a centered, wide, rectangular drawer, with two smaller, rectangular drawers on either side. All of the drawers are covered with the same full grain leather as above, and the smaller drawers have an “X” design on their front made with gilt nails. Each drawer has a hand forged, iron, pull handle in its center. 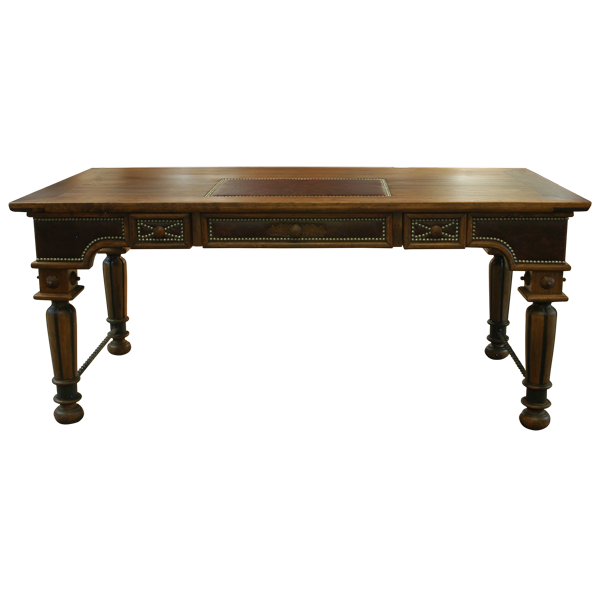 The leather is hand tacked to the solid wood frame of the desk with ornate, gilt nails. The desk is supported by robust, highly detailed legs. The top of each leg has a square design, and each side of the design has a hand forged, iron concho. The remaining part of each leg is beautifully, hand turned, with fluted details, and the legs end in hand turned, round feet. The legs are connected with hand forged, iron crossbars with a spiral design. The desk is made with the best, sustainable, solid wood available, and it is 100% customizable.